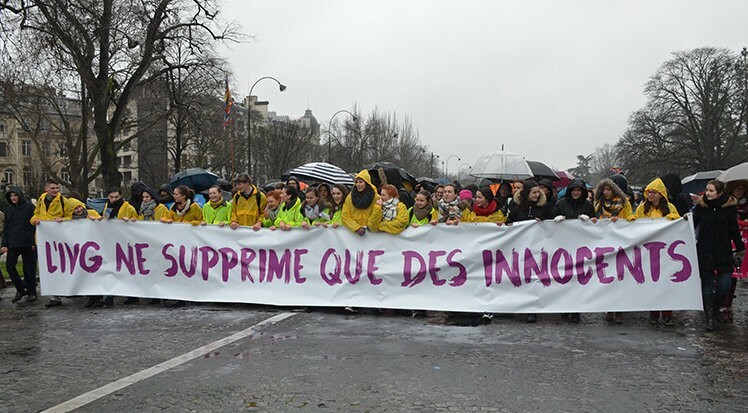 Under a forest of brightly colored umbrellas, participants in France’s 12th annual March for Life gathered in Place Dauphine, many of them dressed in sweatshirts proclaiming “I love life,” before beginning their procession through the streets of the city. The French march took place just two days after a similar demonstration in Washington DC, scheduled to coincide with the anniversary of Roe v. Wade, the infamous 1973 Supreme Court decision that legalized abortion throughout America by discovering an unwritten “right to privacy” in the U.S. Constitution. A series of speakers animated the marchers, including Tugdual Derville, general delegate of Alliance Vita, who reminded demonstrators that 55 percent of French women believe that the number of abortions is abnormal and worrisome, and perpetuates a “culture of vulnerability.” Derville compared the millions of slain embryos to “family secrets” that nobody wants to talk about but that prevent society from moving forward. Jean-Marie Le Méné, president of the Lejeune Foundation, noted the irony of a society that makes greater efforts to protect animals than it does the most defenseless human beings. 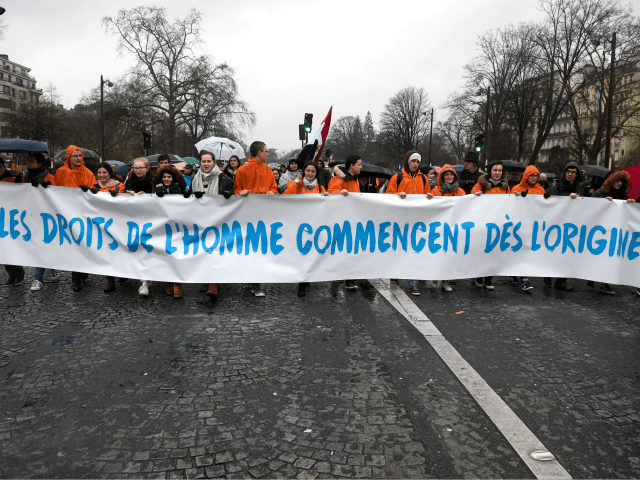 Speakers warned of the trivialization of abortion, legalized in France in 1975, as well as further bioethical abuses such as proposals to legalize euthanasia. Observers were struck by the youth of the demonstrators, many of whom were in their teens or twenties, while even the spokesperson for the march, Victoire de Gubernatis, was only 25 years old. Clerics, nuns and bishops were also intermingled among the demonstrators, offering visible encouragement from the church hierarchy for the pro-life cause. “We are creative minorities and we preach in the desert,” said Bayonne Bishop Marc Aillet, comparing the demonstrators to John the Baptist preaching in the desert. Other leading prelates also attended the march, including Bishop Dominique Lebrun, Archbishop of Rouen. Organizers reminded the more athletic among the demonstrators of an upcoming “run for life,” a half marathon to be held on March 4 in Paris for to benefit the Lejeune Foundation, especially dedicated to the defense of persons with Down syndrome. Predictably, the secular media, which unapologetically defends the abortion industry in France and elsewhere, devoted sparse coverage to the event, preferring instead to focus on a brief episode involving a handful of Femen counter-protesters asking for sperm donations. According to Worldometers, there have already been 2.5 million abortions performed around the globe in the first 22 days of 2018.